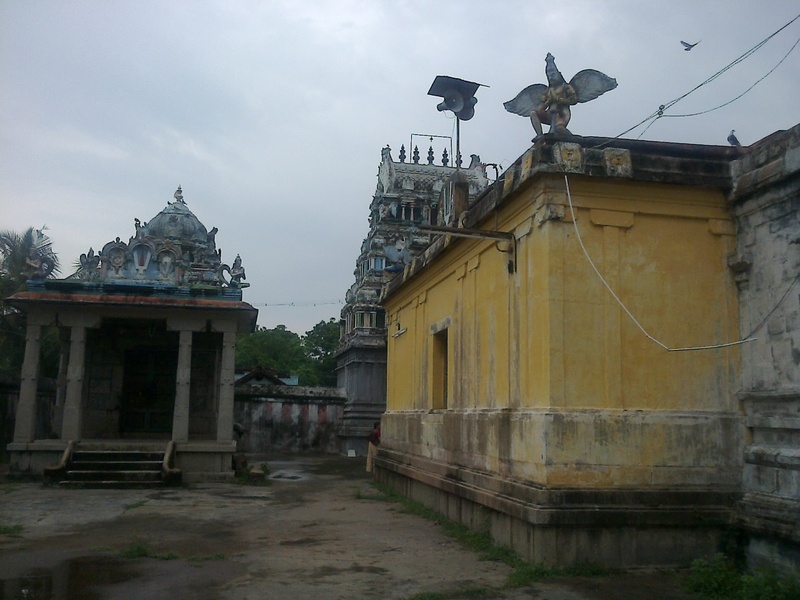 Thiruthevanartthogai or Madhava Perumal Temple is a Hindu temple dedicated to Lord Vishnu located in Keezhchaalai, close the holy village of Thirunangur, Tamilnadu, India. 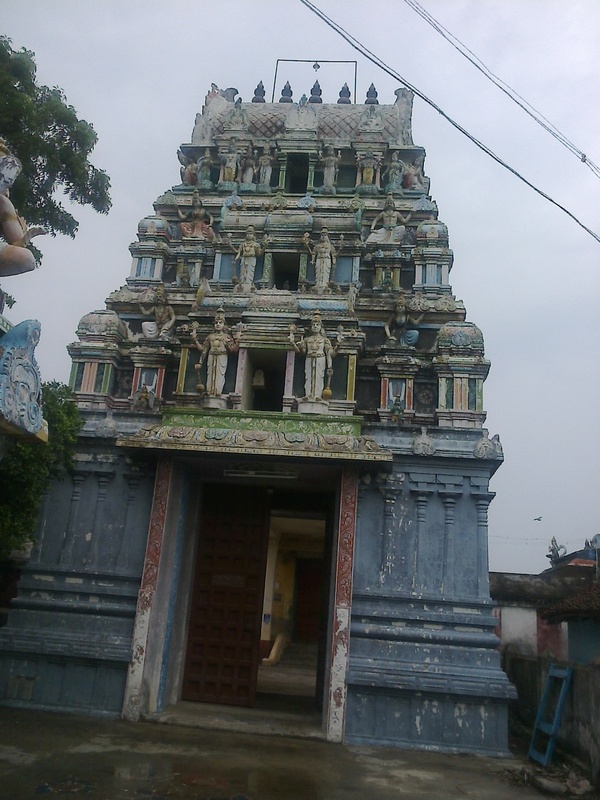 Thiru Devanar Thogai is one of the 108 Divya Desams of Lord Vishnu located in Nangur near Shirkazhi, Nagapattinam, Tamil Nadu. 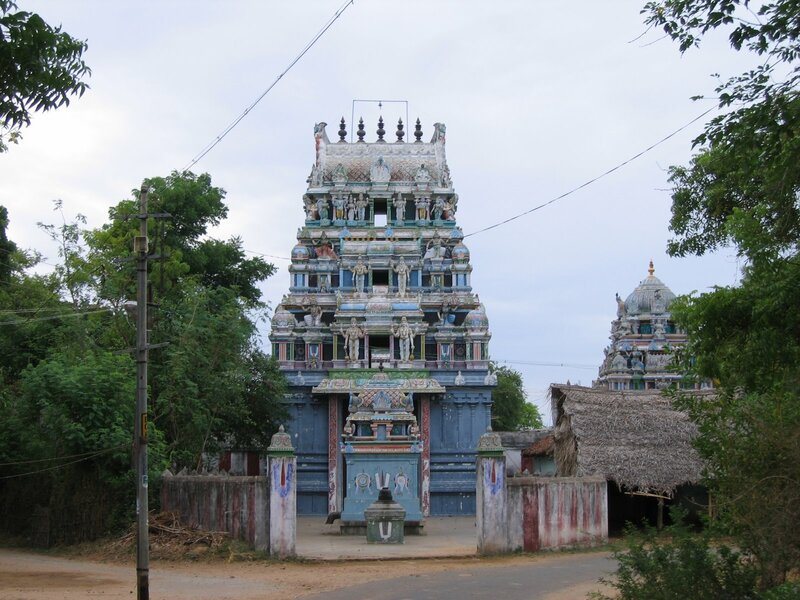 Located about 3 kms North East of Annan Koil and 2kms from Purushottamar koil, Madhava Perumal koil in Devanar Thogai on Keezha Salai is said to be the place where the Devas came in groups and congregated to have darshan of Lord Vishnu in his 11 different forms. The Lord here is from Thiru Vidanthai. It is believed that Sage Vashista undertook penance here and had darshan of the Lord. It's been said that Lord Narayana married Goddess Lakshmi Devi who emerged out of the Thiruparkadal at this place. 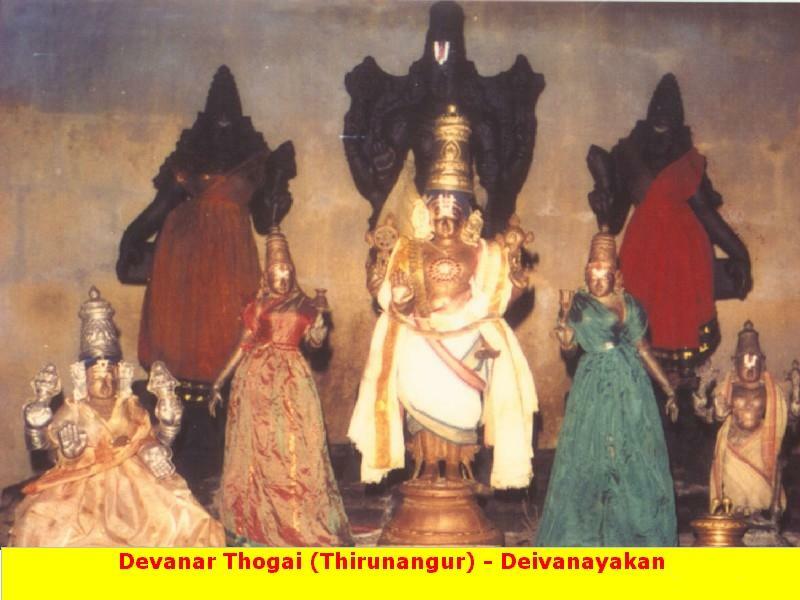 As the Deva's (celestial persons) came in a group (Thogai in Tamil) this place is called Thiru Devanar Thogai. It is situated on the South bank of river Manni. It is believed that, after having dharsan of this perumal, unmarried persons get married and childless couples got the boon of child birth. As this place was graced by the Celestial persons, the shadow of the Vimaanam falls within the range of the Vimaanam (temple tower) itself. The term Madhavan, Emperumaan are common for both Lord Shiva and Lord Vishnu. Henceforth to represent this unison, though the temple is a Vishnu temple, there is a burial ground the favorite place of Lord Shiva in the backyard of this temple. 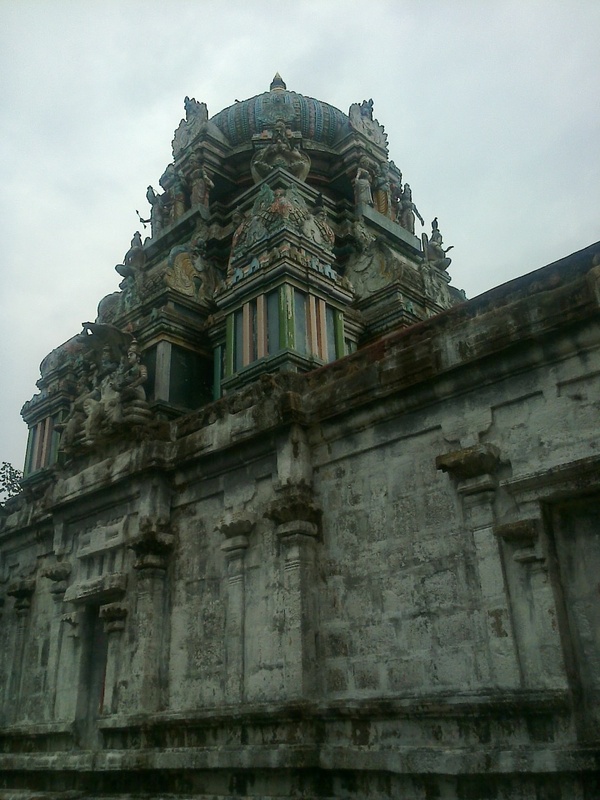 The Vimaanam of this temple consists of two stories and is of a magnificent structure. As the Lord is in the Marriage pose, the Vimaanam and Pushkarani are named Shobana Vimaanam and Shobana Pushkarani respectively. And in order of homage to the celestial persons, the pushkarani also named as Devashaba Pushkarani. Among the Saptha rishis (7 great saints) Vashista is considered as the top most person. He is the son of Lord Brahma (i.e.) he was born by the mental thought of Lord Brahma. The term Vashista means "Best Rishi among all others". So Lord Deiva Nayagan gave dharsan to this great Rishi as young married couple. The idols of Thayar and perumal are of small size only. The legend has that while churning the milky ocean by the deities and demons for the elixir of divine nectar of immortality Goddess Sri Mahalakshmi emerged out of the ocean along with precious wealth. Instantaneously Goddess Sri Mahalakshmi took her place on the chest of Lord Sriman Narayana. Afterwards, the deities and Sages assembled on this sacred land and worshipped Lord Vishnu to have the dharshan of Lord in his wedding attire. The compassionate Lord provided them dharshan to his devotees as they have desired. This temple remains open from 08:00 AM to 11:30 AM in the morning and 05:00 PM to 07:30 PM in the evenings.